Back when Common decided to collaborate with the Jonas Brothers on a song called, “Don’t Charge Me for the Crime,” I knew hip hop had seen better days. Flash forward to over a year later, though, and you have Kanye West and Raekwon ecstatic over doing a remix of Justin Bieber‘s “Runaway Love”. Well, now it’s here, and yes, it’s as awkward you could imagine. 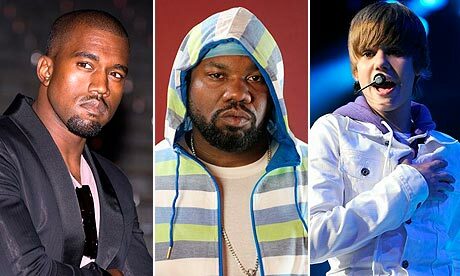 Raekwon opens the track with an IHOP reference while Justin Bieber sings one of the worst choruses I’ve heard in years, and to top it off- without any respect for the integrity of the hip hop genre- Kanye West decides to sample the legendary “Wu-Tang Clan Ain’t Nothing ta F**k Wit” on this Bieber remix. Anyways, if you feel like forming your own opinion on this strange collaboration, listen to it below. This entry was posted in New Music and tagged Justin Bieber, kanye west, Raekwon, Remix, Runaway Love. Bookmark the permalink. Hi, Albert aka Anduan here, sorry but I need to go to the bathroom, need to rinse out the hydrochloric acid in my mouth AFTER THROWING UP. Wonder when Beaver’s ovaries are gonna descend…2016 is my educated guess.